Located on top of Restoration Hardware, RH Rooftop is one breathtaking rooftop restaurant that will for sure impress anyone with its glamorous decor. Adorned with chandeliers and marbled tabletops, this American fare restaurant “ blurs the lines between residential and retail, indoors and outdoors, home and hospitality.” This rooftop is not only gorgeous on the inside but also has a beautiful landscaped park and a wine terrace with “iconic” views of downtown Manhattan. Roof at Park South is a seasonal rooftop cocktail bar and garden oasis above the Park South Hotel. Roof at Park South provides a unique sky-high experience with quintessential summer cocktails to pair with a delicious bar menu from James Beard Award Winning Chef Tim Cushman — the perfect complements to unobstructed views of the city skyline, making it the best outdoor celebration destination. Expect a new menu and a refreshed look when the roof reopens on May 1st, with a sneak preview week kicking off on April 22nd. Situated up on top of The Sanctuary Hotel, away from all the hustle and bustle of Midtown down below. Haven is a year round fully enclosed and elevated oasis surrounded by breathtaking views of Manhattan and offers guests delicious food and craft cocktails. Dine on Steak Au Poivre with peppercorn sauce or Branzino and don’t forget to pair your meal with one of their seasonal signature cocktails. Whether you’re in the mood to frolic in the sun with a cold beverage in hand or to party with a bunch of friends in the city that never sleeps, Haven Rooftop is a chic and festive restaurant and bar that offers a DJ, flat screen TVs, and a night to remember. A rooftop oasis with sweeping views of the city, Broken Shaker offers an eclectic menu of handcrafted cocktails and fresh bites. Located in The Freehand Hotel, Broken Shaker is a James Beard Award finalist and winner of Tales of the Cocktail’s Best American Hotel Bar. Offering cocktails that are the perfect blend of elixirs, syrups and infusions, paired with fragrant herbs, fresh-pressed juices and exotic ingredients from around the world. SERRA FIORITA, located within Eataly NYC Flatiron, will have an extensive spritz cocktail menu featuring the traditional Aperol version, plus five twists on the classic (think: violet flower liqueur and frozen Aperol spritz). The Rosato Spritz with Rosato, Luxardo Maraschino Liqueur, club soda, and Thyme will be a highlight. Staying true to our respect for nature, SERRA FIORITA will tout an extensive biodynamic wine list. Staple dishes will include the Burrata (Liuzzi Burrata with Broccoli Rabe Pesto), Gnocchi di Patate (Mamma Emma Potato Gnocchi, Farm.One Basil, Parmigiano Reggiano DOP, Pecorino Romano DOP Pine Nuts) and large format Porchetta. 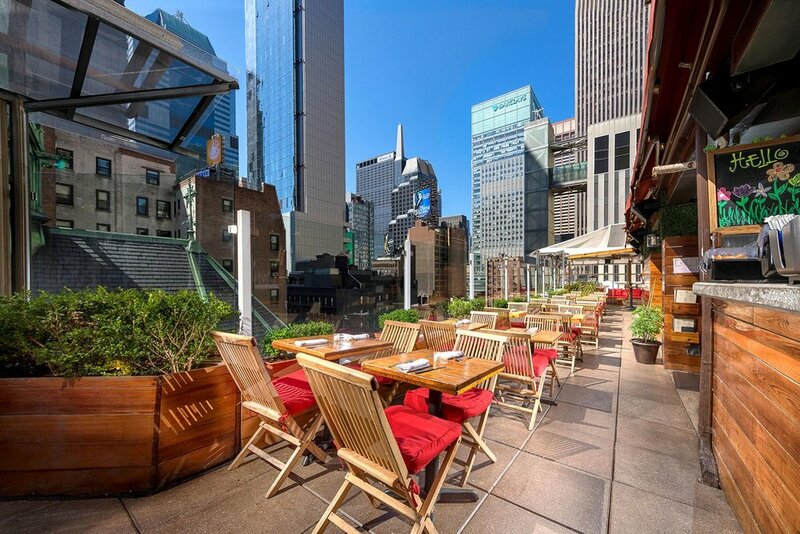 Cantina Rooftop offers panoramic views of NYC and is considered one of the most fun rooftops in Manhattan. Located in Hell’s Kitchen, this rooftop restaurant is perfect for date night with it’s bright and lively decor. The restaurant offers authentic Mexican creations with a decadent flair, courtesy of Chef Saul Montiel. A seamless blend of contemporary luxury and bohemian chic, Hotel Hugo pays tribute to the storied history of Lower Manhattan and SoHo’s enduring art-meets-industrial edge. The sophisticated property delights with its easy mix of Marcello Pozzi architecture, thoughtful amenities and excellent views. Whether travelers are seeking a stylish New York City hotel near Hudson Street or a sleek Soho rooftop bar for cocktails and stunning Hudson River views, Hotel Hugo captures the neighborhood’s timeless appeal. This luxe Soho hotel and favorite among the fashion set, will be reopening its beloved outdoor rooftop bar, Azul, in April 2019. Azul is a Cuban-themed rooftop, transporting guests to Old Havana, with 360-degree views of the city. The rooftop's bright colors and twinkling festoon lights serve as the perfect setting for drinking in the sun or under the stars. Azul’s eclectic menu draws inspiration from Cuban cuisines, with a Cuban inspired food and drink menu. Located on 132 West 27th Street, The Wilson opened in October 2018. The restaurant is just through the entrance of INNSIDE by Meliá New York and is home to a stunning, laid back open terrace that acts as a sun trap during the spring and summer. The open back terrace of the split level venue acts as an oasis of greenery and light in the middle of New York City. Inspired by the fabled relationship between a seasoned fisherman and his beloved bulldog, The Wilson celebrates true camaraderie - the camaraderie of food and drink, New Yorkers and visitors, family and friends. Mondrian Terrace is located on the 15th floor of the Mondrian Park Avenue. Overlooking the corner of Park Avenue and 30th Street, the terrace offers breathtaking views of Manhattan paired with signature cocktails, small bites, and year-round outdoor seating. Mondrian Terrace is a year-round al fresco venue that features both indoor and outdoor lounge seating. The terrace is available to book for private events or open to the public every Friday and Saturday from 5pm to 11pm. Located on the 21st floor, The Crown is a beauty of its own. With expansive views of the Manhattan skyline and Brooklyn, the bar serves as the premier hang-out for those looking to escape the daily business of the city below for an airy, streamlined getaway just for the night. Using Asian inspired cocktails and small bites that derived from the diverse tastes across the world, The Crown focuses on bringing unique culture into the local New York neighborhoods all while creating a space for the community.